However, back to knitting ... I believe it was when middle Dear Daughter was in high school and oldest Dear Daughter was home at Christmas time from college that oldest Dear Daughter taught her sister the rudiments of knitting. After that, oldest Dear Daughter lost interest but middle Dear Daughter had found her crafty talent. Ever come across something that you felt an affinity to? That you just KNEW how to do stuff? Well, knitting is that "something" for middle Dear Daughter. She poured over books and patterns and websites and generally never met a knitted item that she couldn't do. It was the following summer that Mr. Pirate, myself and middle Dear Daughter had a mini road trip Adventure to Colville, WA to visit my cousin. She had left many precious family photos in my care. I needed to return them but didn't dare trust them to any delivery or postal service. Besides, a road trip sounded like fun. From our house in the middle of California, we took three days to drive to Colville, which is in the northeastern part of Washington state. We drove our mini-van, packed with camping gear and the boxes of family photos. It was on Day 2 of the drive to Washington that middle Dear Daughter leaned forward from the back seats to tell me, "Look, Mom! I've turned the heel!". She had brought a book to teach herself how to knit socks. She had never knitted socks before and here on her first attempt, she had successfully turned the heel. Now, even *I*, as a non-knitter, know that Turning the Heel is a BIG DEAL. And so I exclaimed my appropriate amazement at her accomplishment. She just sorta looked at me, as though I had sprouted a second head and said, "Mom. It's no big deal. I just followed directions.". I mention this story to illustrate that middle Dear Daughter is incredibly talented with knitting. She can knit anything. And she probably has. According to her recollection, it was sometime in 2006 that she knit an off-white lace square and gave it to me. I'm not sure if she had any reason to make it, other than it just looked pretty. Look at the details of this piece! I'm just not educated enough to extol the specific intricacies, but look at the corner detail! And the edge detail! Those pointy scallops are simply divine! At about 14" square, I wasn't sure what to do with it. 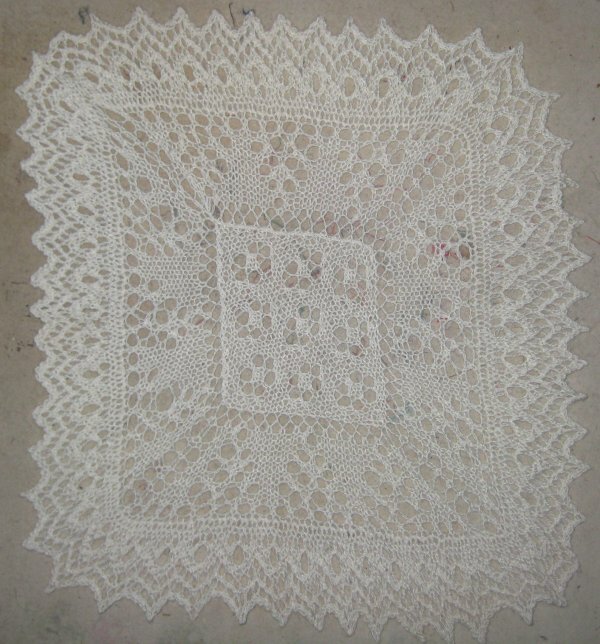 I sure wasn't going to use it as a doily! I needed to wait until inspiration hit me. So, I simply kept it folded up, but visible, in my sewing room. Every so often, I'd open it up, admire it but fold it back up again. Sometime after that, I was in a home dec store which had the most amazing inventory of oddball sized pillow inserts anyone had ever seen. They even had *round* pillow inserts! 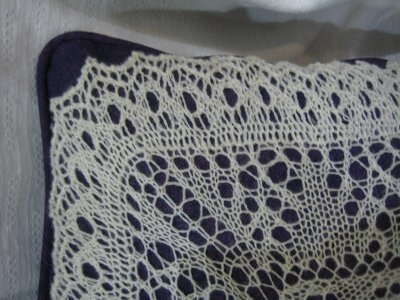 I was terribly excited and realized that I could put the knit lace piece as an applique on a throw pillow! So, I bought the round pillow insert. 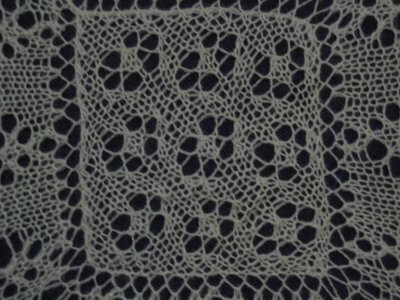 Imagine my surprise and dismay when, upon my return to home, I rediscovered that the knitted lace was SQUARE, not round. Well, drats. 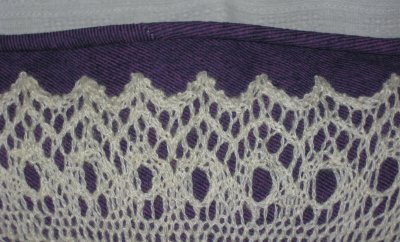 Back the knitted lace *square* went on the shelf until I remembered to buy a SQUARE pillow insert. Let's fast-forward to current year, 2012. I have a wall-hanging on my longarm frame, waiting for the last little bit of quilting. I have a hand-piecing Forever Project that I could work on. I have many, many, MANY completed quilt tops that are waiting to be quilted. Let's not mention the continual housework that always needs to be done. Do I finish that tiny bit of longarm quilting? No. Do I contemplate pairing up the completed tops with suitable backings? No. Do I do housework. Are you out of your MIND?? Of course not! Yes, it finally dawned on my that I *have* a 16" square pillow insert in my stash. 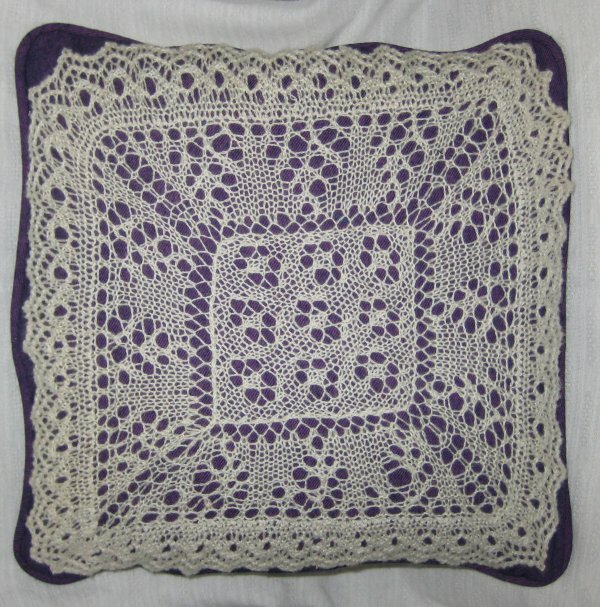 It would be perfect for the knitted lace square! I found some absolutely *perfect* purple over-dyed denim to make the pillow cover. I had cable cording to make the piping. I even had a zipper suitable for the closure! It was a Sign ... it was time to make a display piece for the knitted lace square. Appliqueing the lace square onto the front of the pillow cover would show off the lace without damaging it. Although I have the complete series of books, there are only a few that I have regularly used over the years. "Decorative Techniques" is one of those books. Among other things, it deals with making throw pillows. All kinds and shapes of throw pillows. It starts you off with the basic piped, knife-edge pillow and progresses from there. I have used these directions for many, many, many pillows. The instructions are exhaustive and thorough. And so it was with complete confidence that I started constructing the throw pillow cover late one night. And therein lies the problem. I'm sure you realized it as soon as you read "late one night". Projects started "late at night" are fraught with dangers. Misreading directions is one of those dangers. And yes, a nearly fatal error was made. I've successfully followed these directions for years. But, it never fails to amaze me that, no matter how often I have used directions, I can STILL totally foul it up. Specifically, after you have sewn the piping around the edge of the top, you pin the back and top right sides together but ONLY on the edge where the zipper extension is. The purpose here is to sew ONLY a mere 1" from the edges towards the center along the piping seam. This leaves the rest of the (unsewn) seamline available to put the zipper in. In order to EASILY sew the zipper in, you are NOT NOT NOT to stitch the pillow top to the back all the way around. If you are stupid enough to do that, do NOT NOT NOT trim the seam allowances (to eliminate bulk). If you do both of those steps, you are royally ... ummm... in a pickle. However, there needs to be an opening to be able to get TO the zipper for stitching, so I very reluctantly removed the stitching from the side opposite the zipper. This was easily the most frustrating and creative way that I've sewn a zipper in a throw pillow. Because the pillow already had the sides sewn, I couldn't open it up flat for easy machine stitching of the zipper. I was reduced to hand-sewing (in a very constricting space) the final stitches that attach the zipper to the seam extension. Note to self: pay ATTENTION to the written directions! They worked before! They are accurate! Do NOT become distracted! I am *relieved* to say that this cautionary tale ended satisfactorily. The zipper installation turned out well, although I'm not going to be putting any undue stress on it "just in case". Instead of sewing in a separate label to the inside of the pillow, I wanted to advertise that middle Dear Daughter had hand-knit this. 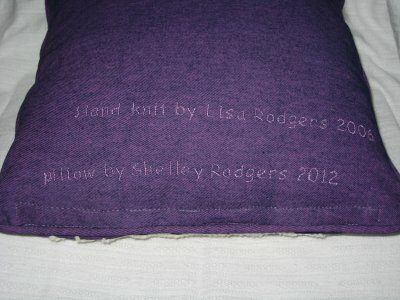 So, I machine embroidered the appropriate wordage and year on the back of the pillow cover. And in the spirit of Truth in Advertising, I also machine embroidered that I made the pillow. Except that I got the placement off. Way off. Instead of the two embroidered lines being nicely on top of each other, there is a BIG UGLY space between them ... AND ... the horizontal placement was not correct either. I think it was just one of those Late Night Things That Happen. At least, that's what I'm going to chalk it up to.